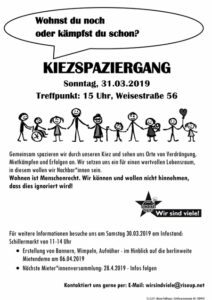 What is Kiezversammlung 44 all about? We want to change things! Our neighbourhood is being sold off. Our living space has become a highly attractive commodity. But apartments are more than just tradable consumer goods, and neighbourhoods are more than mere groups of residential buildings. The neighbourhoods we live in are the places we are familiar with and where we converse with one another socially. Put briefly, our homes are the focal point in our lives from which we can live our lives in dignity. The consequences of urban change are all too familiar: prices start to spiral upwards, the pressure of financial competition leads to selection, which means selecting out the weakest and poorest in our community. Party politics and lobbyism have consistently established the framework conditions within which this process takes place. There is no interest in becoming involved in the social matters in our neighbourhoods. We can no longer accept this and are no longer willing to negotiate with policies like these. That is why we have decided to organise ourselves. We are looking for shared ways that would get everyone the help they need. Everyone has the right to live in an attractive neighbourhood!